Protect your caravan or motorhome against sun, rain, snow, dust, bird lime, tree sap, airborne pollutants and heat. If you want to keep your pride and joy looking good and the caravan's exterior healthy, buying a caravan cover is one of the most important spare parts for your caravan you can buy - and affordable, at that. 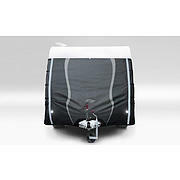 When buying a caravan cover or motorhome cover it is important to buy a good quality item. Make sure that the fabric interior does not absorb water as if it rains this dirty water and grit will be held against your caravan. It needs to be fully breathable meaning that even if the caravan or cover is slightly damp, the cover allows it to dry. It should be soft material which won't scratch the windows or dull the paintwork and includes lashing straps that feed beneath the caravan to secure and tighten it. 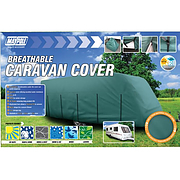 The caravan covers you will find here on Leisureshopdirect are all high quality caravan and motorhome covers specifically designed to protect your 'van. Our caravan covers and motorhome covers are a universal fit and measurements should be taken from the rear most point of the outer body to the point at which the sloping front edge of the caravan meets the A-Frame. When you're putting your caravan to bed for the winter you need to make sure it'll stay safe and protected from whatever nature can throw at it. The truth is, any time you are not making use of the caravan regularly you should consider using a caravan cover to help keep it sheltered. Made out of breathable polypropylene fabric, which lets moisture out rather than trapping it against the caravan, a well-made caravan cover keeps the paintwork and trim on your caravan looking pristine. Maypole caravan covers are available in various lengths to suit all major makes and sizes of caravan, from 12' right up to 21' in length. They're shaped to fit snugly over your caravan and offer a tidy profile and they've quick release, buckled straps to help keep the cover secure in every weathers. For convenience during long storage periods, our covers also provide zipped side panels so that you can get inside your caravan without needing to remove the covers first. We also have hitch covers to guard the hitch from grit or other debris - W4 Caravan A Frame Cover and Towing Protectors which offer waterproof and breathable protection to help with the prevention of damage from stone chips, road film, exhaust debris and insect residue. Why use a Caravan Cover? Today's caravan covers for sale bear little relation to the covers of yesteryear. Modern manufacturing techniques and fabric-bonding technology means caravan covers are actually lightweight, ultra-strong and long lasting to provide maximum protection and convenience. Give the caravan a good clean for example with Fenwicks Bobby Dazzler before putting it for storage and will be great as new when the covers are removed for your caravanning trip. You've just purchased a new caravan or motorhome which you can clean with Fenwicks Motorhome Cleaner, winter kicks in, your pride and joy is in storage so you visit check up on it and so what can you find, the elements have given it a real good bashing. Well when this has happened to you personally or perhaps you have concerns this will happen to you, don't settle-back in silence, you'll be able to combat the weather by protecting your unit from the outset using a caravan cover. During the winter months the wind can come up up and cause dust and grit to be spread around, this could cause damage to your units surface by scratching it and potentially dulling the windows. It is not just the elements that can attack your unit you need to protect against, other than rain, snow and sun there is also the damage from bird droppings, tree sap etc. By protecting your unit with a caravan cover you are effectively putting an extra skin onto it which offers great protection from condensation and mould, when the caravan cover you're using is breathable, if it's not a breathable cover you could potentially be creating a far larger problem than just dirt! Water expands when it gets cold enough and turns to ice, this can in turn damage your caravan panels and joints, a breathable caravan cover could help protect your unit from the chance of this. Motorhome Covers produced from grey, heavy duty, breathable, non-woven, polyproplene material, comes complete with storage bag. This material is water-resistant but not 100% waterproof because of its breathable nature. The breathability allows moisture and damp to escape. A fully waterproof cover can actually cause overwintering dampness problems by trapping damp and condensation inside without way of escape. 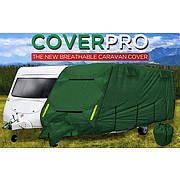 Coverpro Caravan Cover is a breathable cover with 4 layers. 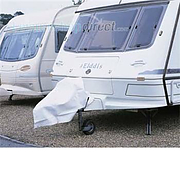 These premium caravan covers provide excellent protection for the extremes of British weather. Maypole offers amongst the best quality non-bespoke caravan covers on the market today. 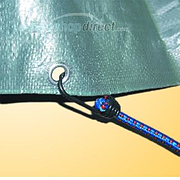 The Maypole Motorhome covers are manufactured to the same high standard as the Maypole caravan cover range. 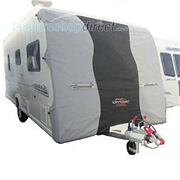 The A Frame Caravan Cover is a large hard wearing cover. It protects hitch, hand brake and 12N/12S cable storage ports and is ideal for winter storage. It comes complete with draw strings. 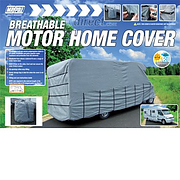 Breathable Caravan Covers & Motorhome Covers.